Choose from over 100 layouts all with the latest trends in mind. "Back in 2016 I was looking for a new look to my business website. My name is Greg Bowman, owner/broker of Bowman Commercial Realty (aka, Bowman Realty). A friend of mine referred me to Close Realty. I called and within a couple weeks we were working on designs and layouts. Because we were a commercial real estate company we had a lot of different needs from their standard formats. Stephanie and Lee were great to work with and understood what we wanted. We would discuss our needs and they would come up with ideas and ways to implement them. Thanks to them we now have been up and running with our new website for all most two years. From Bowman Realty, all my staff, all our customers and clients, we want to thank you for all you hard work and especially your patience in dealing with me and all my requests. GREAT JOB!" No more substituting beauty for ease and flexibility. It's all right here! view portfolio. Copyright © 2019 - CloseRealty.com - All rights reserved. 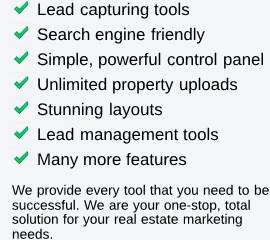 Close Realty is maker of real estate websites for real estate agents and brokers nationwide. The real estate websites are designed specifically for today's needs of REALTORS. Websites combine award winning graphics design, innovative software development, and are hosted at a state-of-the-art hosting facility.